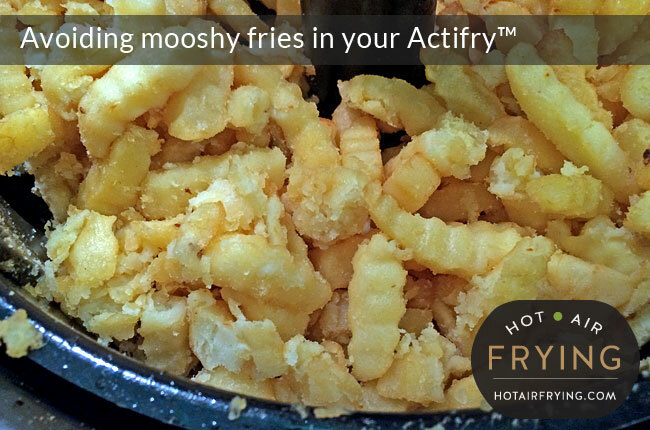 It is possible to make mooshy fries / chips in you Actifry, and the cause is almost always too much moisture present in the pan. The following is a 7-second video. Look for the tell-tale puffs of steam rising off the fries at 5 seconds. All that steam is not a good sign of what’s ahead. They are going to start breaking up into a soft crumble in places, and overall the potato is well behind “schedule” in terms of crisping up. You will be starting to wonder what is taking them so long. And to achieve all the above, we have of course overloaded the machine, practically up to the rim of the pan, as much as it will possibly hold. And that was indeed the occasion for the photos above. Why does overcrowding the Actifry pan matter? 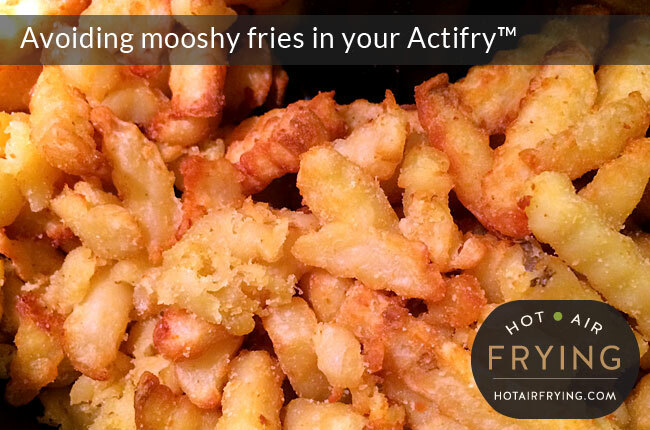 We quickly realized that overcrowding the Actifry pan with fries would cause the fries to take significantly longer to cook, but we figured we didn’t mind: we’d just throw them on to cook earlier. It’s not as though you have to do anything else after that. But then we realized that the results were always less than stellar. Turns out, that inside the Actifry, you need a certain amount of empty, dry, hot space for the magic of crisping and browning to happen. Deny that, and steaming will happen instead. When steaming happens at any point during cooking fries, you are going to end up with a different texture of fry inside and out that no amount of extra cooking time will completely correct. 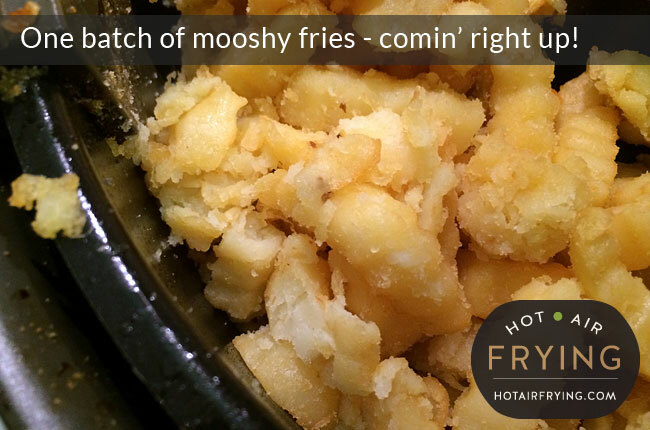 You must allow a certain amount of empty, dry, hot space when making fries (or roast potatoes.) You will figure out over time how to gauge the right amount for your machine. Whatever the potential cause of too much moisture in the pan, sufficient space in the pan will take care of it. The first thing you can do is, right at the start, when you first become aware of a lot of steam, is to remove maybe 1/4 or 1/2 of the fries (depending on how much you overcrowded it), and put them in a stainless steel bowl on the counter at room temperature and cover them. (They won’t blacken on you, as they will be coated in oil at this point.) Treat them as a second batch and cook them separately when the first batch is done. If instead you don’t have time for that kind of futzing, then just keep on cooking right through and past the steam phase and allow a far longer cooking time overall. Like, maybe even as much as 20 to 25 minutes extra. You will still get perfectly edible chips, they will just taste more like oven fries. Most of them will be soft on the side and the outside, and only slightly golden. The few that browned will be slightly harder inside instead of the usual fluffiness you expect. Just supply lots of vinegar, mayo, ketchup (lots of gravy even!) for people to pour on the fries and they’ll be none the wiser. What you really need to do instead is just make two batches. Allow yourself twice the cooking time, obviously, so you can start out much earlier with the first batch. When the first batch is done, put it in a large metal bowl, cover that with tin foil, and pop into an oven turned on low. Then make the second batch as per normal. When that’s done, add to the large metal bowl, stir and serve. The separately cooked fries / chips will be far better than two batches crowded into one go, and, the difference between two combined batches and one “normal round” of chips will barely be noticeable. 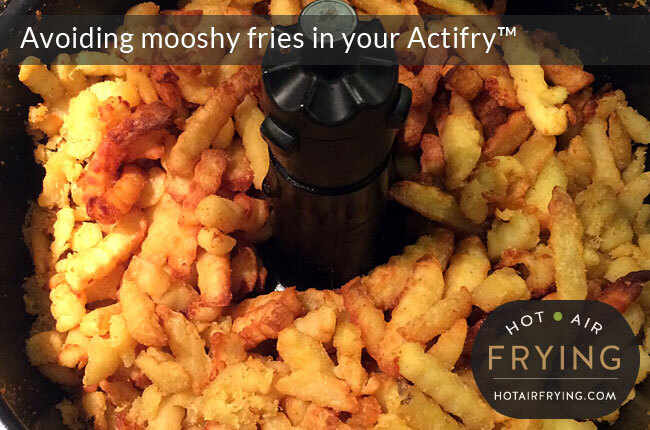 Have you ever tried Jicama in your ActiFry? We just got our fryer & I want to try jicama fries or chips in it but haveyet to come across a recipe anywhere. When we’ve tried jicama fries in the past cooking either in oil or in the oven they are finicky. Sometimes they take forever, sometimes they never crisp up, other times they turn to mush. If you’ve tried them in your ActiFry I would appreciate any tips or tricks you may have. Thanks! Seems like it would be helpful to get Frozen French fries As Dry as Possible BEFORE cooking them in an air fryer- any suggestions on HOW to do this? Also, how about adding a small amount of oil ( & maybe some salt)?? How much?? Well. Can’t get much drier than what comes out of a freezer, on the surface anyway, that’s why freezer burn happens to food. Additional oil is at your discretion.